On Sept. 6, Webster Vienna hosted a panel discussion organized by the Academic Council of the United Nations System (ACUNS) Vienna Liaison on the theme, "Youth Combatting Discrimination and Prejudice on the Grounds of Ethnicity and Religion." The discussion was chaired by Franco Algieri, head of the International Relations Department at Webster Vienna. The panelists came from a wide range of specialties, presenting their work with minorities and discussing their projects addressing issues that minority groups in Europe face today. One panelist, Irina Spataru, a Romani woman who came to Austria at a young age, provided insight on what it was like growing up as an "invisible Roma" and spoke about her earlier experiences as a minority. Read the full story at Webster Vienna. 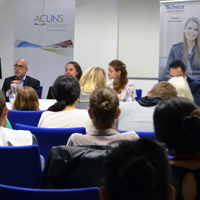 See information about last year's symposium with ACUNS on eliminating violence against women here.